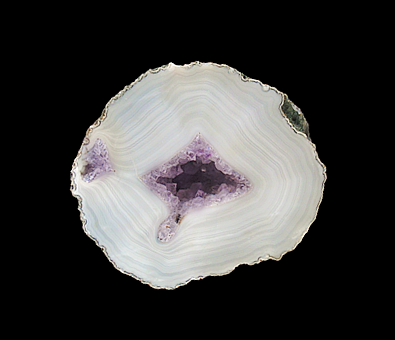 A striking sliced and polished geode from Argentina. 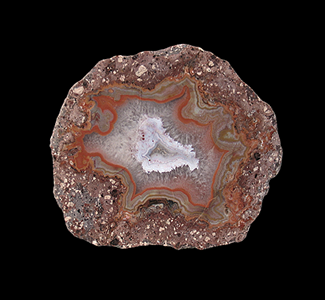 The Chalcedony geode is lined with vibrant, rust-red, botryoids with a strong, coffee-colored rim. The locals have given these colorful nodules the name “Orellanita”. This Agate is unlike any I have seen from the Czech Republic. During an early stage of its formation, membrane-like layers of minerals came off the walls of the cavity, broke and were deposited in a colloidal silica solution. 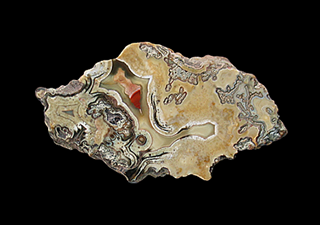 This Agate has a light-blue color that is accented by veins of silver-gray hematite that have colored the Agate red. A very striking and eye-pleasing combination of colors. Here we present one-half of a sliced and polished nodule of Azurite from one of Australia's most famous Copper localities. While not that good-looking on the outside, when opened these nodules reveal cavities lined with sparkling deep blue crystals of Azurite. This is one of the most colorful Dugway geodes that I have come across in my 30+ years of collecting. What you typically get with a Dugway are washed out earth tones and if you are lucky, light blue Chalcedony and some small crystals of Quartz. 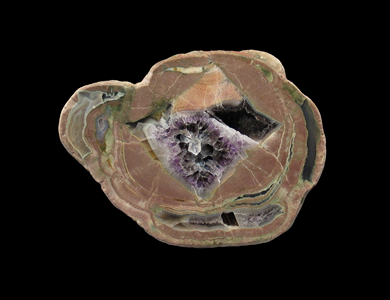 This multi-chambered nodule has a good red-brown hue accented by bands and areas of green with a central chamber of rich-colored Amethyst. 10 x 7.3 x 4.6 cm. 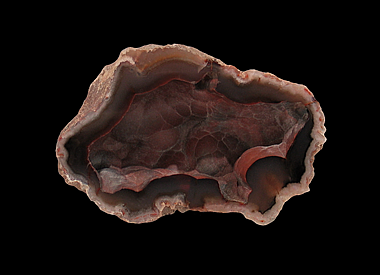 A beautiful translucent nodule of Agate. The vug in the center is lined with lemon-yellow-colored Quartz crystals. I backlit this specimen a little to better illustrate its translucency. 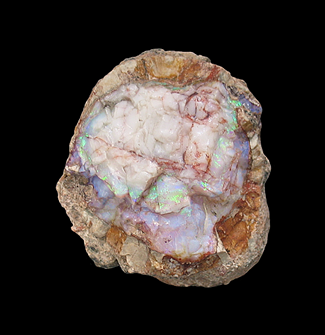 This striking specimen of “Yowah Nut” Opal consists of a Sandstone nodule that is permeated by Opal of many different colors that it makes for a very colorful and aesthetic specimen. This is the first one of these that I have encountered that has a hollow center. 7.8 x 5.9 x 2.1 cm. When I was in Egypt in April 2010, I saw many nodules of Jasper and Chalcedony just lying around on the ground out in the desert near Cairo. I wondered why no one has ever offered this material for sale. In 2011, while at the Tucson show, I was fortunate enough to run into a dealer who had some of these nodules for sale. I made a trade with him for two of these specimens. It was explained to me that these colorful nodules are difficult to polish. Jasper is a dense, opaque, microcrystalline variety of Quartz. Or more strictly; Chalcedony and is usually red, brown or yellow and coloured by Iron oxides. I think I chose some good ones, with nice earth-colored tones and interesting banding. One thing that I have noticed in my many years of collecting is that there is not too much available when it comes to Egyptian minerals. 7.5 x 6 x 2 cm. Here we have a multicolored Agate and Quartz Thunder Egg with a small vug at its center. 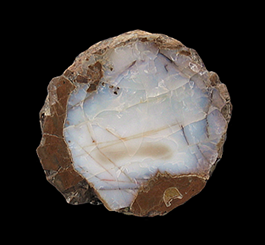 The Agate portion shows fine banding with an inner rim of flame-colored Chalcedony. Nowy Kosciól is a classic Polish locality. Thunder Eggs such as these are highly prized by Polish Agate collectors and are rarely available outside of Europe. When you think of American Opal, the Virgin Valley in Nevada is usually the first to come to mind. This specimen hails from America's other large Opal location, Spencer, Idaho. With a population of 38, it is home to one of the largest Opal deposits in the United States. This is one of the most vividly colored Opals of this size that I've seen from this location. 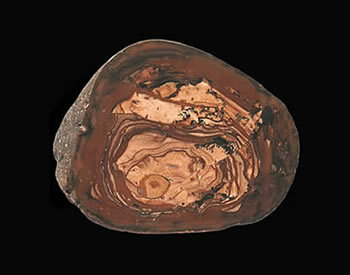 While the center of this nodule is opaque, the rest of the specimen more than makes up for this. This colorful Opal nodule has a strong saturation of color, more than my photographic skills can capture. 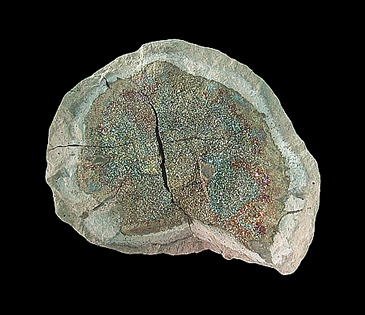 Broad flashes of green, blue, violet and a little red can be seen no matter how the nodule is oriented. The Opal at this mine are contained in a Rhyolite and Obsidian flow with abundant gas pockets. Hydrothermal fluids from hot spring activity filled the pockets with both common and precious Opal. A colorful specimen that is sure to brighten up any mineral display. Despite its size, this Malachite geode really has a presence. The vug of this specimen shimmers very much like velvet due to the dense sheaves of micro-acicular crystals. 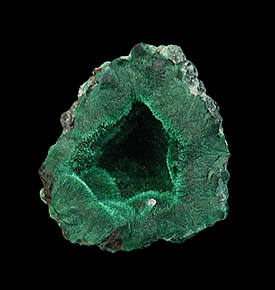 This specimen is solid Malachite with a small crystal of Barite protruding from the edge of the specimen's vug. Specimens such as these are quite uncommon despite the fact that there is so much Congolese Malachite available to collectors. 7.5 x 7 x 2.6 cm. 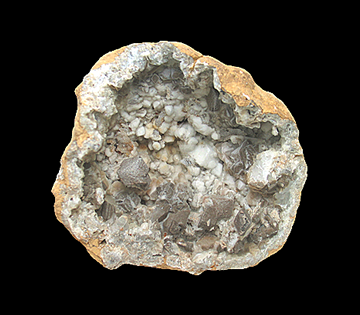 Here we have a geode that very much resembles the more famous nodules from the Dulcote Quarry which is about 30 or so miles to the southeast. This ocean front location has been known for its geodes since at least the 1800's. According to H.T. De La Beche, in his Memoirs of the Geological Survey published in 1846, he puts forth the theory that these are weathered out of the seabed offshore and wash up on the beach. A very colorful specimen from south America's other agate location, Mendoza Argentina. Agates from this location have a reputation for being as colorful as their Brazilian counterparts. I acquired this Agate about 10 or so years ago from a friend who imports a lot of material from Brazil. I chose it because I had never seen one of this particular color that had an Amethyst vug at its center. And I have yet to see another like it. It was only recently that it dawned on me that I had seen this material, but it had been made into spheres. Which might explain why I had only seen this one intact geode half. 11.5 x 9.5 x 5.2 cm. A really cool specimen. Although it is not apparent in the photo this specimen is very 3 dimensional. Also, the stacked brownish rhombs of Calcite make for a nice contrast against the lining of smaller white Calcites. 12.5 x 10.4 x 4.7 cm. While once abundant, the days of easy digging at the Potato Patch are over. This location has long been a favorite spot to collect and has been hit hard over the years. These days there is not much to be found there. This example of Chalcedony, Agate and a little cit of coarsely-crystallized Quartz is classic, older material that Agate & Thunder-egg collectors hold in high regard. 10.2 x 9.2 x 4.4 cm. 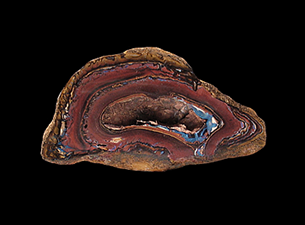 A multicolored Thunder Egg type Agate with a hollow center from a classic Polish locality. Thundereggs such as these are highly prized by Polish collectors and are rarely available outside of Europe. 7.5 cm. x 8.5 cm. x 5 cm. These iridescent Pyrite nodules were quite popular during the short time that they were available in the mid 1990's. Put one of these in your mineral cabinet and it will add a lot of sparkle to your collection. This specimen is nearly a complete half-section. Almost all of these that were offered were not hemispherical in shape, but rather were just chunks of clay with pyrite on them. I think that this can be attributed to the fact that the internal fracturing and the hardness of the nodule were not conducive to splitting them cleanly in half. 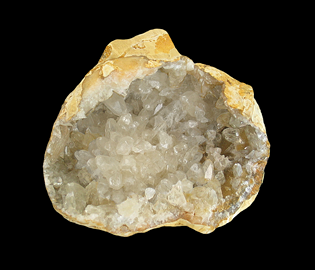 A geode filled with many lustrous and clear crystals of Calcite measuring up to 1.7 centimeters in size. If you examined, in person, the matrix that these occur in you'd be surprised that they can be extracted more or less intact. 9 x 6 x 4 cm. 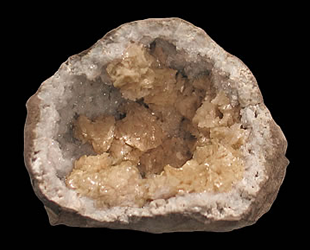 A showy specimen of translucent and lustrous Calcite crystals inside of a Quartz-lined Geode. This specimen is from an obscure location and is older material that is not often seen for sale. 8.2 x 7.1 x 3.7 cm. Here's something that you don't see for sale very often. 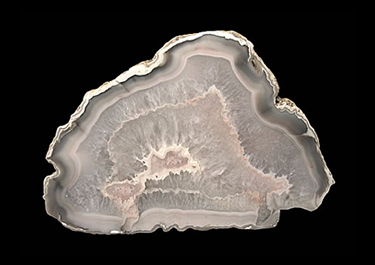 The area surrounding the twin cities of Idar & Oberstein gained notoriety for the fantastic Agates & Amethyst lined geodes discovered there in the mid 1500's. By the beginning of the 1800's the production of material had fallen to a small fraction of what was found in its heyday. This polychromatic Agate features finely banded layers of gray, white and pink culminating with a vug of tiny Amethyst crystals in its center. While occasional specimens can be found, there is no steady supply of material from this classic location. One thing that Oregon has an abundance of is Thunder Eggs. There are plenty of Thunder Eggs that are filled with Quartz and Agate, but not many that are filled with Opal. This specimen has very subtle pink-colored flash. 13 x 12 x 3 cm. Here we have a very large section of Agate from Germany's Black Forest. The center of this slate-colored Agate is filled with Quartz crystals. 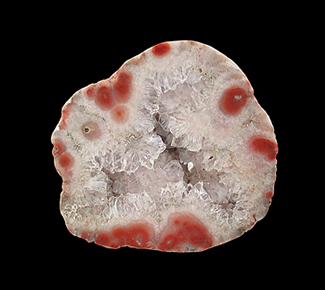 The section of this Agate that has the Quartz crystals is outlined by a red-colored mineral, most likely Hematite. In my 23 years of collecting I have only seen one other example of this material. There are many Agate localities all over Germany, but few Agates ever make it to the United States. 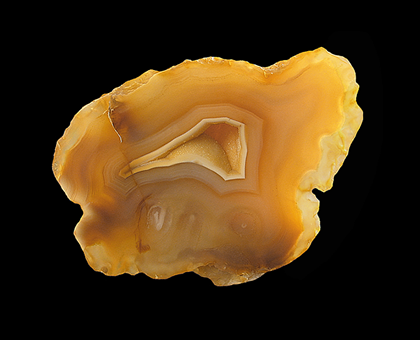 A vividly-colored Agate from Patagonia. 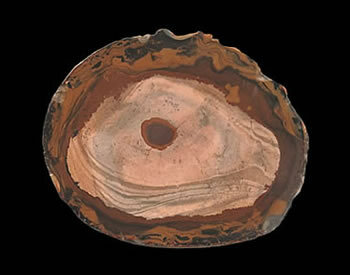 This Agate exhibits a parallax which is sometimes referred to as winking. 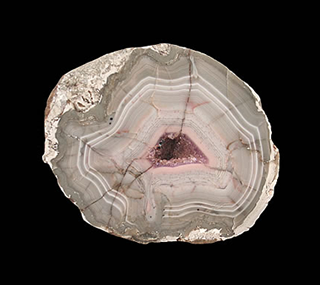 When a banded Agate forms with close alternating opaque and transparent bands, the light entering the Agate can cast an observable shadow from one opaque band onto the next. As the parallel bands change their perceived angle, the appearance of movement and perception of depth occur. 6.2 x 5.4 x 4.5 cm. While it is true that Agate specimens from Brazil are very abundant, every once in a while you find examples that are more interesting than most. A while back, while visiting with a friend of mine that has a shop in San Diego, he showed me about 50-60 Agates that had been polished all around, not just on the front face. As a rule, I don't buy Agates from Brazil, but I was impressed enough with what he showed me to buy a half dozen of them. 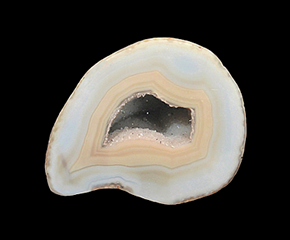 This specimen has an outer band of light- blue with a sandy-yellow colored bands, followed by clear Quartz at the center where there is a cavity lined with a druse of small Quartz crystals. Not your everyday Agate from Brazil. 13.5 x 11.7 x 7.6 cm. Often referred to as “Potato Stones” by the local collectors because the outer portion of these nodules resemble a potato. 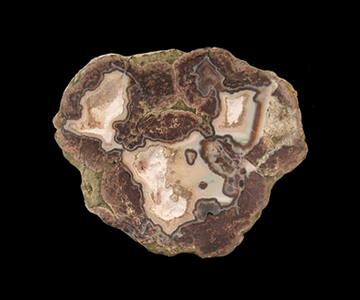 Although there are many of these to be found in the hills & surrounding valleys, these once abundant geodes and nodules are almost never seen for sale these days. This is due to the fact that the main deposits are either located on private property or in quarries, making it almost impossible to collect specimens. 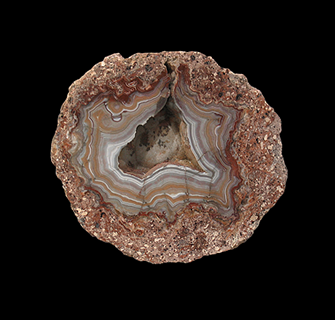 The geodes and nodules from this classic location are much prized by collectors due to their colorful nature and endless arrays of circles and bands that make each one of these specimens truly unique. A multi-colored, densely banded, polished agate nodule from Argentina with good form. 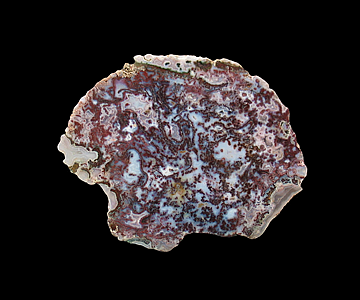 This Agate features dense banding of reds, pinks, blues-gray radiating outward from its offset center. 7 x 5.3 x 4.6 cm. One of the more obscure geode locations in the midwest is Warsaw, Illinois which is a little bit south of and just across the border from the more famous, classic locality, Keokuk, Iowa. The Warsaw geode areas have yielded some pretty good specimens over the years. This specimen that I am offering here is one of the best looking Dolomite geodes that I have seen from this locality. 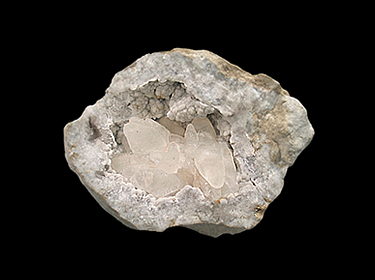 This specimen consists of a shell of Calcite with a layer of tiny, clear and sparkly, Quartz crystals which serve as a host for numerous, curved, Dolomite crystals. A top-notch specimen from America's mid-west. 11.2 x 7.5 x 3.5 cm. Here's something that you don't see for sale very often. The area surrounding the twin cities of Idar & Oberstein gained notoriety for the fantastic Agates & Amethyst lined geodes discovered there in the mid 1500's. By the beginning of the 1800's the production of material had fallen to a small fraction of what was found in its heyday. 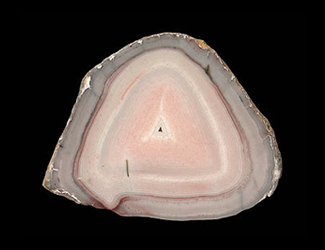 This specimen features finely banded gray, white and pink Agate alternating with layers of Quartz. While occasional specimens can be found, there is no steady supply of material from this classic location. 7.2 x 5.4 x 5.6 cm. Here's something that you don't see for sale very often. 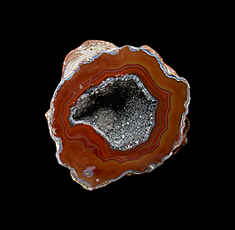 The area surrounding the twin cities of Idar & Oberstein gained notoriety for the fantastic Agates & Amethyst lined geodes discovered there in the mid 1500's. By the beginning of the 1800's the production of material had fallen to a small fraction of what was found in its heyday. This polychromatic Agate features finely banded layers of gray, white and pink making for a specimen with a striking contrast of colors. While occasional specimens can be found, there is no steady supply of material from this classic location. 6.5 x 3.4 x 2 cm. 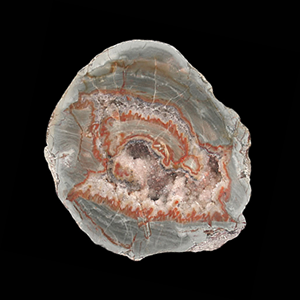 The region surrounding Idar-Oberstein has been a source of colorful and interesting Agates for nearly 500 years. 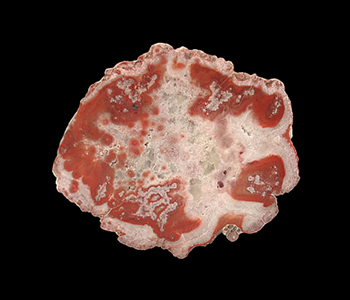 This interesting example features a light coffee-creamy colored Agate with a red area near the center of the vug. You don't seem to see many examples of German Agates for sale here in the United States.